Don't want to end the fun, want to keep the trimming going? Purple Cows wants to provide a long lasting life span for your blades and 9-Blade trimmer with the Trim It Replacement Cutting Strips. In this pack of 3, you'll be able to ensure a smooth and heavy-duty cut from the start to finish. The trimmer is designed for an easy and simple strip replacement with just 3 stress-free steps. Prepare and help make your Purple Cows 9-Blade Trimmer last, be the inner CraftGeek that you are and continue expanding your moo-creativity! Welcome to MyBinding video. 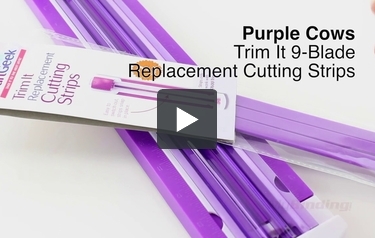 This video is on Purple Cows Trim It 9-Blade Replacement Cutting Strips. One secret of keeping your trimmer nice and sharp and working well is having new cutting strips. With the Trim It 9-Blade, simply lift the track right in the middle; a small bend and a pull and it pulls it right out. And whether you know it or not, that little stripe right down the middle is a cutting strip. It protects the blade and helps it perform well. After flipping it over a couple of times, you might just need to replace it, so pull the old one out, put the new one in, snap it all back together and you’re on your way. For more demos, reviews and how-to’s, check out MyBinding.com. Thank you for your question. The Purple Cows Trim It 9-Blade Replacement Cutting Strips are specific designed to work with the Purple Cows Trim It 9-Blade trimmer. We do ship internationally. If you put items in your cart and view the cart, you can enter your country and postal code to get the shipping cost. Thank you for your question. These are 15.70 inches.